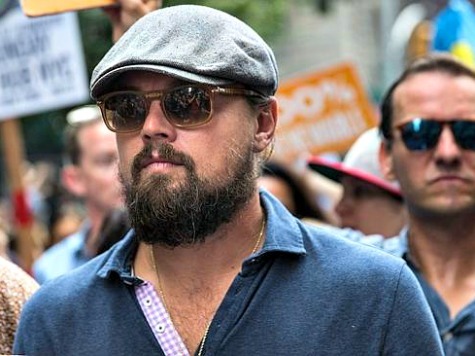 Leonardo DiCaprio, who spent the summer traveling around the world in his private jet, stopped in New York on Sunday for the “People’s Climate March,” where he demanded that global leaders finally address the climate crisis. The actor and environmental activist was recently nominated by the United Nations to receive the prestigious “Messenger of Peace” award, with which he will be honored at the UN Climate Summit in New York on Sept. 23. DiCaprio was accompanied by former vice president Al Gore at the rally. Gore, who won an Oscar for his global warming documentary “Inconvenient Truth,” was exposed in 2007 for hypocrisy. A report revealed that his Nashville mansion consumed more energy than 20 times the national average. In the film, the former vice president challenged Americans to live a more conservative lifestyle by reducing their energy consumption at home. New York City Mayor Bill de Blasio came to show his support. The event was organized by 350.org, founded by Bill McKibben, and more than 1,000 environment groups were in attendance. In addition, an estimated 2,000 “climate-focused” events were taking place in other countries including Afghanistan, Britain, France, and Bulgaria. President Obama will join forces with 120 world leaders on Tuesday for the United Nations climate change summit, where DiCaprio will be rewarded for his advocacy efforts. Secretary General Ban ki-moon has high hopes that the massive gathering will encourage others to take action.